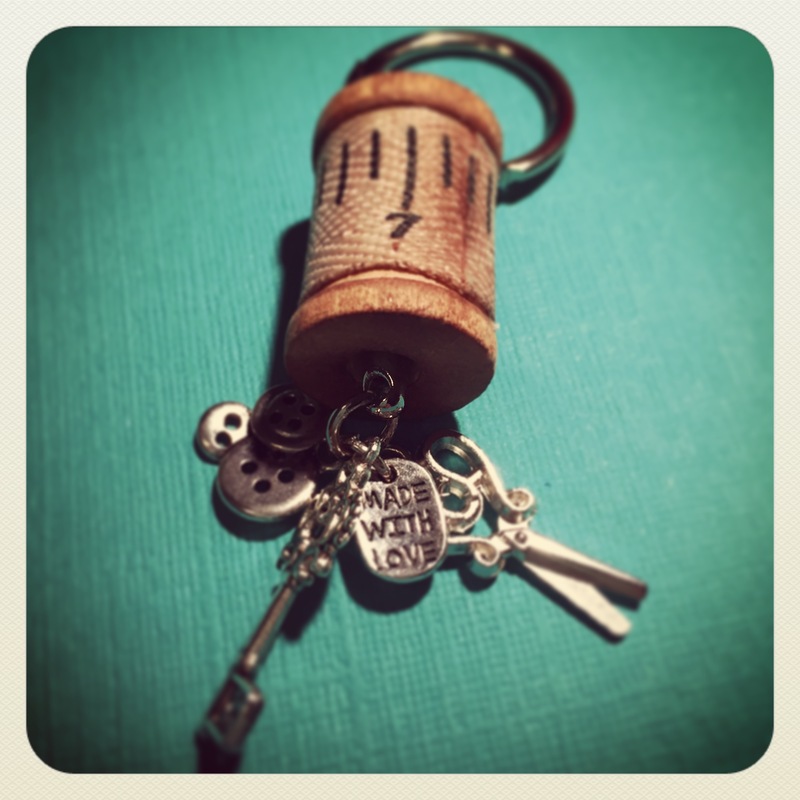 I’ve seen so many cute things made with wooden spools…this key ring is one of my favorites! They are so easy to make and you can personalize them using different charms. I found my charms at Bohemian Findings on Etsy. This shop has tons of different themed charms, great prices, and quick shipping! I will be ordering from them again 🙂 The “made with love” charm is from Hobby Lobby. I got these locking key chains from Amazon. 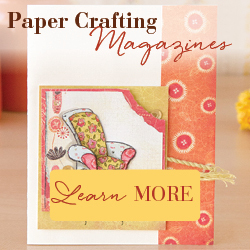 The wooden spools are 3/4-inch tall and available at Michaels and Hobby Lobby or your local craft store. 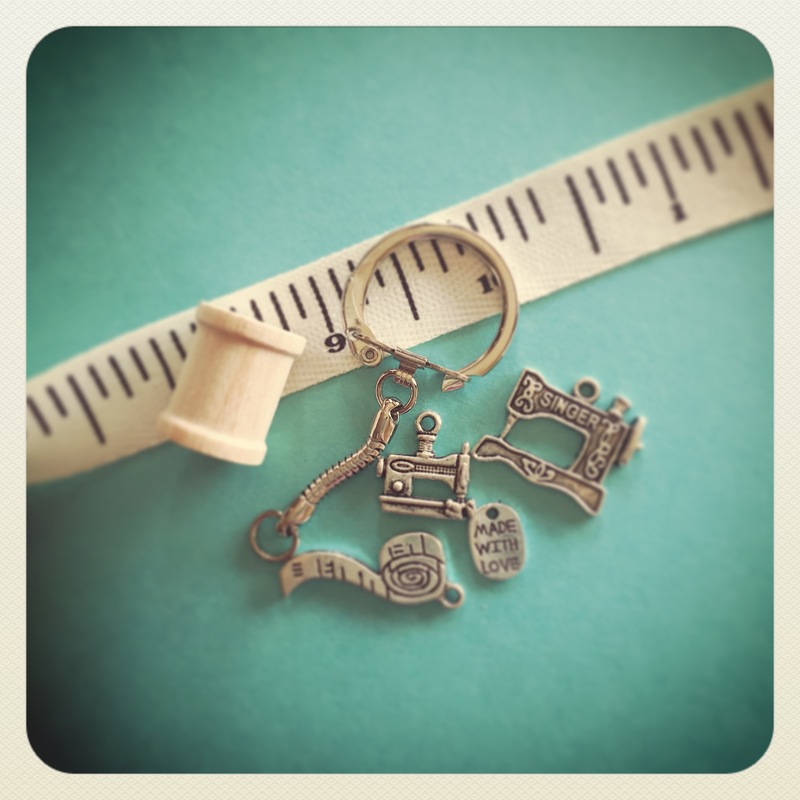 This key ring is a sewing theme (I also included a tiny key charm) and I found this great ruler ribbon at Hobby Lobby. The first thing I did was cut a small piece of ribbon to wrap around the spool. Then I inked both the ribbon and the spool with brown ink to give it a bit of an aged look. I glued the ribbon to the spool. You’ll need to take the jump ring off the bottom of the key chain. Be sure to twist it open and not pull it open. Thread the chain through the spool and slip the jump ring back on. Before twisting the jump ring closed, slip the charms onto the ring; I like to put 2 on each side. Then twist the jump ring closed. And that’s all there is to it! And here I am all set to make my next key ring!